SEVERE FROST AND temperatures dipping to -2 degrees are forecast for tonight. Met Éireann has warned that lowest temperatures will range from -2 to plus 4 and will be coldest in the south and east of the country. 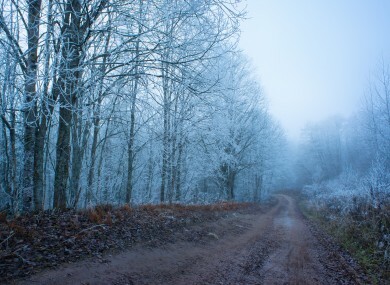 Frost is also forecast for many areas and will be “sharp or severe locally”. It comes as up to six inches of snow is forecast for some parts of the UK tomorrow. The forecaster added that “cloud will increase from the Atlantic overnight and southerly winds will freshen gradually. This will help to clear much of the frost. Rain will push into west Munster, Connacht and west Ulster by daybreak also. Meanwhile, Dublin Fire Brigade is warning of slow moving gritters on motorways tonight. Email “Below freezing temperatures and severe frost forecast for tonight ”. Feedback on “Below freezing temperatures and severe frost forecast for tonight ”.